Today was Mitchell's turn to come and spend the day with Aurora. 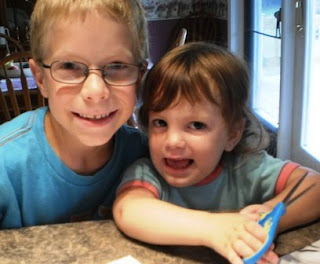 He spent some time doing sticker crafts with her and coloring some Dora Shrinky Dinks. 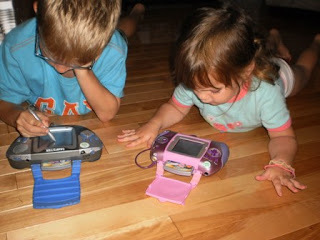 Then after lunch he was going to show Aurora how to operate this new little Leapster. A great find on Kijiji. It has a Dora game. She really got a charge out of that... She calls this her DS because all the kids have a DS. After a couple of hours of training, I guess we decided that she was a bit too young for this toy, so maybe we'll try again next summer. She loved playing with it, but couldn't get the concept of pushing the button to make the moves. Tomorrow, we're off to the cottage where Caitlin will join us. Looks like the weekend is a success so far! Your kids are adorable! Cute little grandkids! I enjoyed looking through your blog.